Inspections & Maintenance according to appropriate industry standards. Expert Witness for tree house and zip line related cases. Want a local referral instead? Why Hire a Consultant for a Tree House? Consulting is an important and growing part of the tree house building industry. The costs of full service custom treehouses are significant, but people still want their tree houses to be built safely. 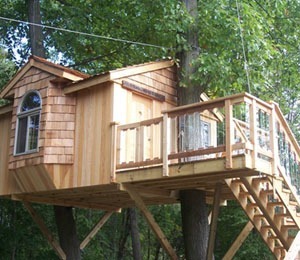 The best solution is often to hire a tree house expert to help get the project started the right way. Building tree houses is an art and science that draws on many fields such as carpentry, tree biology, welding and machining, and engineering. All of these are common enough skills. What is not common, and in fact exceedingly rare, is having all of these skills working in harmony within one company. The part of your tree house that needs an expert the most is the tree to treehouse interface(s): any place where any part of your tree house touches or is within a few inches of your tree(s). If these areas are not handled with skill and experience, then it will lead to trees suffering unnecessarily or the tree house being unsafe, whether immediately or at some point down the road. Other than these all important tree – tree house interfaces, any good local carpenter with an imagination can build a great treehouse and any good local arborist can care for your tree. The point is that most arborists and most builders don’t build good tree houses! You need experience, good practices, and all necessary skill sets actively working together. However, if you don’t care about the health of your trees, the safety of people using the tree house, or don’t need the the treehouse to last more than 5-10 years, and your first priority is getting our blessing upon a cheaper way to do things, then you are not a good candidate for our consulting help. We don’t build tree structures inexpensively: we focus on high quality.